Here at the Spokane Arena, big basketball news was being made. The biggest news, arguably, of the entire tournament, you could say. Hawaii had just beaten Cal — and handily, at that — making for a 13-seed over a 4 upset, which hadn't happened since 2013. That news, however, was quickly overshadowed. By the middle of the second half of Hawaii's 77-66 win, anyone not decked out in blue and gold Cal apparel was rooting, and rooting vigorously, for Hawaii, which makes sense, given that Spokane is basically the Hawaii of the lower 48. The place was rocking, led by a diehard group of actual Hawaiians who made the pan-Pacific flight to the mainland for the game. 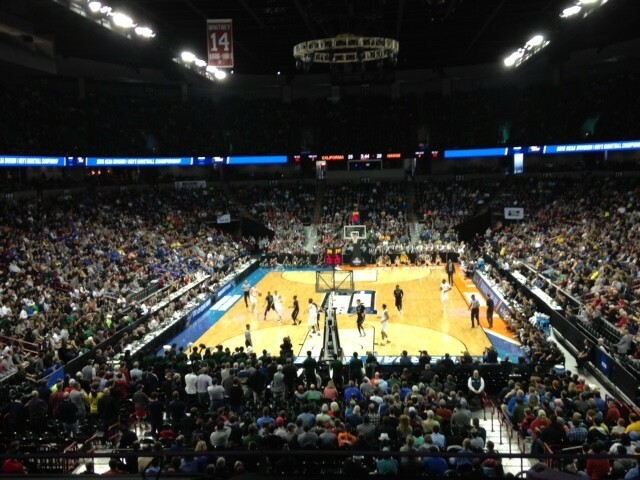 One guy told me he'd been in Anaheim for the Rainbow Warriors' win in the Big West tournament — flew back to the islands and then came to Spokane yesterday. Even folks at the arena just to take in a game probably thought they'd just seen what would be the most talked-about game of the day. Well, that changed a half-hour later when Middle Tennessee State did the unthinkable and knocked off Michigan State — the team about 22 percent of the people who filled out an ESPN bracket picked to win it all. Many are calling this the biggest NCAA tournament upset EVER. Spokane can nevertheless pride itself as Upset City. The last time men's games were held here, Harvard beat Cincinnati and North Dakota State knocked off Oklahoma. There could be more upsets to come, too. Hawaii will play the winner of the Maryland vs. South Dakota State game. Following that contest, all those green and yellow folks who traveled up from Oregon will begin making their way into the arena.